We’ve added two new yarns this season to our Aslan Trends collection. Los Andes is a kettle dyed super bulky yarn. 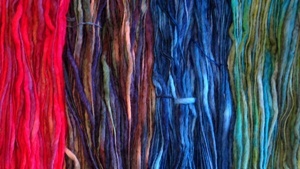 The texture and colours of this yarn make for a fun knitting experience. Grab a couple skeins and a pair of 10mm needles, and you’ll have a scarf made up in no time! Bariloche is a the lighter weight of this kettle dyed collection. Use one skein and size 5mm needles to make a gorgeous warm hat. We have huge binders of hat patterns in both stores, so take a look through and find something you like! 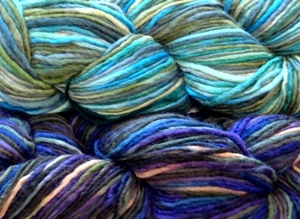 Both of these yarns are incredibly soft to the touch, you wont believe it! This entry was posted on Tuesday, September 1st, 2009 at 11:57 am	and is filed under Uncategorized. You can follow any responses to this entry through the RSS 2.0 feed. Both comments and pings are currently closed.